Emmeline Lock: Happy scary, fantastical, magical Halloween. The DarkSiders are turning one! Happy scary, fantastical, magical Halloween. The DarkSiders are turning one! Do you know what day it it? Halloween means the eternal, "should we stock up on lollies just in case someone knocks?" argument, (Honestly, I think the 500m long driveway and the screaming kids scare them off. ), and the very amusing pictures of drunk pumpkins on the internet. 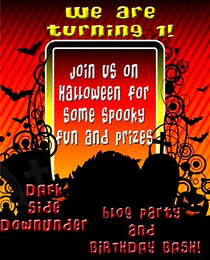 But it also means THE DARKSIDE DOWNUNDER IS ONE YEAR OLD! ON HALLOWEEN! How lovely! How FRIGHTENING! How FANTASTIC! AND THEY'RE HAVING A PARTAY! There are PRIZES and FUN! Get in there and be a part of it! Thank you very much, I hop you had a lovely All Hallow's Eve. We celebrated by eating Twisties shaped like ghosts, then ate the Freddos no-one ventured up the driveway to get. 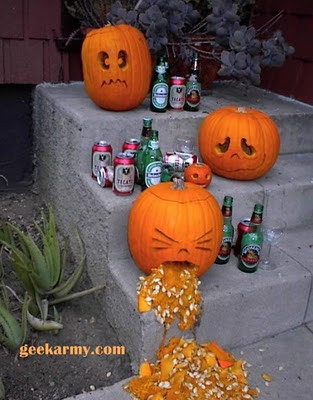 The drunk pumpkins are classic. I wonder who thinks of these things? Huge congrats on DSDU's first birthday. You're it's inner wheel! PS Found my blog post dates. They were there--just black on black. Duh. Thanks for noticing.